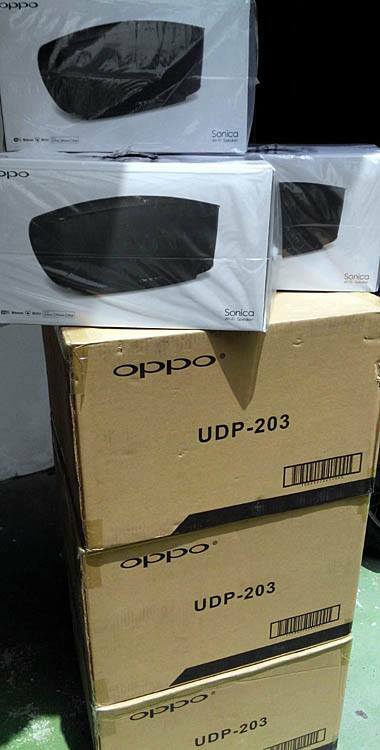 Oppo Sonica Wireless Speaker. Wifi, Bluetooth, AUX in, Network. *Power supply and amplifiers installed on solid metal baseplate for heat dissipation. Sonica uses four amplifiers, bass drivers powered by 2x 15-watt amps in bridged mode, 10-watt amp powers each wideband driver. The new Sonica is designed by the same man behind Oppo’s PM-1 and PM-3 planar headphones, Igor Levitsky, and the $300 short-stack speaker is loaded with virtually all the features you’d expect, with a few notable exceptions. Sonica does have a premium feel, with smooth cuts of matte plastic along the body and silver accents to match the gleaming logo. The speaker also feels very solid, and its weight (around six pounds) is substantial considering its diminutive stature. Ports at the back include a 3.5mm analog input and an Ethernet port for hardwiring. Comprising dual 2.5-inch full-range drivers flanking a single 3.5-inch woofer at the center. The smaller drivers are each pushed by a 10-watt custom amplifier, while the woofer draws from dual 15-watt amplifiers in a bridged configuration. The Sonica supports high-resolution audio in a wide variety of file types (though not DSD), maxing out at 24bit/192kHz. Audio files can be sourced from your phone, computer, or storage drive. A very short list of streaming services is also supported, including Jay-Z’s CD-quality streamer Tidal, and Apple Music thanks to Airplay support alongside DLNA. DSP features allow you to choose from five EQ presets or tune the sound according to your room size. Sonica dives deep towards the 60Hz line, and even sends vibrations through the floor from a table or countertop. Re: Oppo Sonica Wireless Speaker. Wifi, Bluetooth, AUX in, Network. Sorry... just replied, thanks for showing interest.